Marko Stunt replaces Chris Brookes at Battle of Los Angeles this weekend, SmackDown’s viewership, one of the best television matches of 2018, BJ Penn is returning to fight at UFC 232, a press conference is scheduled with Khabib Nuramgomedov and Conor McGregor next week and Bellator is going to Hawaii. Join the POST Wrestling Café! **Chris Brookes has suffered an injury and is out of this weekend’s PWG Battle of Los Angeles (BOLA) tournament. Marko Stunt will replace Brookes in the opening round against Trevor Lee. 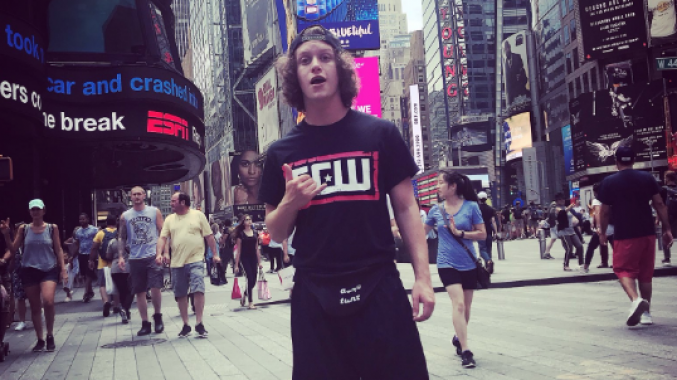 Stunt had been working for IWA Mid-South and received his big break appearing on Joey Janela’s Lost in New York show over SummerSlam weekend for Game Changer Wrestling. Stunt was immediately booked for “All In” following his performance with KTB on the Game Changer show and participated in the Over Budget Battle Royal. BOLA begins Friday night with three consecutive nights at the Globe Theatre in Los Angeles. **Tuesday’s episode of SmackDown Live averaged 2,229,000 viewers on the USA Network, which was a 3.8% drop from last week’s viewership and lowest since August 14th. **The Ironman match between Jay Lethal and Jonathan Gresham from this week’s episode of Ring of Honor can be watched for free on FITE TV. This was the best Ring of Honor television match this year and from a presentation standpoint, I felt it was one of the best television matches period this year. **Impact Wrestling has announced they have sold out the Melrose Ballroom for Bound for Glory on Sunday, October 14th in Queens, New York. **Revolution Pro Wrestling will hold their Global Wars event on Sunday, October 14th at the Brixton Recreation Centre with tickets on sale to the public this Monday and the following matches announced: Minoru Suzuki vs. Tomohiro Ishii, David Starr vs. KUSHIDA, and Walter & Timothy Thatcher vs. Sanada & EVIL. **Impact Wrestling has added the first month of Impact on Spike TV to the Global Wrestling Network. Impact launched on Spike TV in October 2005 with a one-hour slot on Saturday nights at 11 pm Eastern. This coincided with the WWE not being renewed by Spike TV and returning to the USA Network that same month and TNA being able to secure a television deal with Spike, which was an enormous boost for TNA, which was airing their weekly television on the internet during the summer of 2005. **The UFC has announced they will be holding a press conference at Radio City Music Hall in New York City on Thursday, September 20th with Khabib Nurmagomedov and Conor McGregor scheduled to appear at 5 pm Eastern (so, easily 6:30 or later). The press conference is only open to members of the media and will be streamed for the public to watch. **BJ Penn is returning to the octagon and will fight TUF winner Ryan Hall at UFC 232 on Saturday, December 29th. The 39-year old UFC Hall of Famer will have his first fight since June 2017 when he lost by majority decision to Dennis Siver. Penn lost the last five fights of his career and has a record of 1-7-1 since April 2010. Penn, who is a former welterweight and lightweight champion, last won in November 2010 when he defeated Matt Hughes in 21 seconds in their third fight. Since then, Penn continued fighting at welterweight with a draw to Jon Fitch followed by decision losses to Nick Diaz and Rory MacDonald. Penn returned after coaching a season of TUF for the third fight with Frankie Edgar, who dominated Penn in their July 2014 fight with Edgar stopping Penn in the third round. Penn returned in 2017 and was stopped by Yair Rodriguez in January before the Siver fight. Ryan Hall is a 6-1 fighter, who is a world class grappler and won TUF in December 2015 and hasn’t fought since December 2016 where he defeated Gray Maynard by unanimous decision. **Bellator has announced that they will be running a card in Honolulu, Hawaii this December with fights announced. Bellator will run their first card in Hawaii on Saturday, December 15th with the card streaming live on DAZN. The show will feature Hawaiian native Ilima-Lei Macfarlane defending the women’s flyweight title against Valerie Letourneau along with former UFC light heavyweight champion Lyoto Machida making his promotional debut against former middleweight champion Rafael Carvalho. Machida’s contract with the UFC ended after his last fight with Vitor Belfort this past May at UFC 224. Machida has won his last two fights over Belfort and Eryk Anders and will be his first fight outside the UFC since 2006. **Tickets for Golden Boy Promotions first MMA card featuring Chuck Liddell vs. Tito Ortiz will go on sale this Friday at the Forum in Inglewood, California. Tickets start at $30 and go up to $1,000 for Ringside VIP tickets. The poster for the event has also been released. John Pollock & WH Park chat about the recent Golden Lovers vs. Will Ospreay & Tomohiro Ishii tag, the Destruction cards, Zeus defends the Triple Crown against Shuji Ishikawa, the Naomichi Marufuji vs. KENTA match at Sumo Hall, Stardom’s 5 Star Grand Prix, Takayamania Empire benefit card & lots more. John Pollock & Wai Ting review the Jay Lethal vs. Jonathan Gresham Ironman match from Ring of Honor, John chats the latest episode of Lucha Underground, Wai reviews a new comic featuring Rey Mysterio and they chat the recent “Being the Elite” episode. John Pollock & Wai Ting review the final SmackDown before Hell in a Cell, Samoa Joe reads a story, Becky Lynch attacks Charlotte, Brie Bella takes on Maryse, all the news of the day and a preview of the Hell in a Cell card. John Pollock & Wai Ting review Raw from New Orleans with Mick Foley’s return, Ronda Rousey wrestles, The Shield overcomes law enforcement, the day’s top news stories, plus John reviews the AQUA concert from Toronto on Saturday night. John Pollock reviews Saturday’s UFC 228 card from Dallas featuring Tyron Woodley defending the welterweight title against Darren Till, an excellent fight from Irene Aldana and Lucie Pudilova, big wins for Jim Miller & Diego Sanchez, Nicco Montano stripped of her flyweight title, UFC 229 look ahead & more. Chris Charlton is joined by Joe Gagne and travel back to 2000 with the year NOAH was formed, New Japan and All Japan work together, Jushin Liger moves to heavyweight, the circumstances behind Zero-One forming, “DO Judge! !” & more. John Pollock & Wai Ting’s live show from Starrcast during “All In” weekend where they spent close to 90 minutes taking questions from the live audience and chatting a wide range of topics.